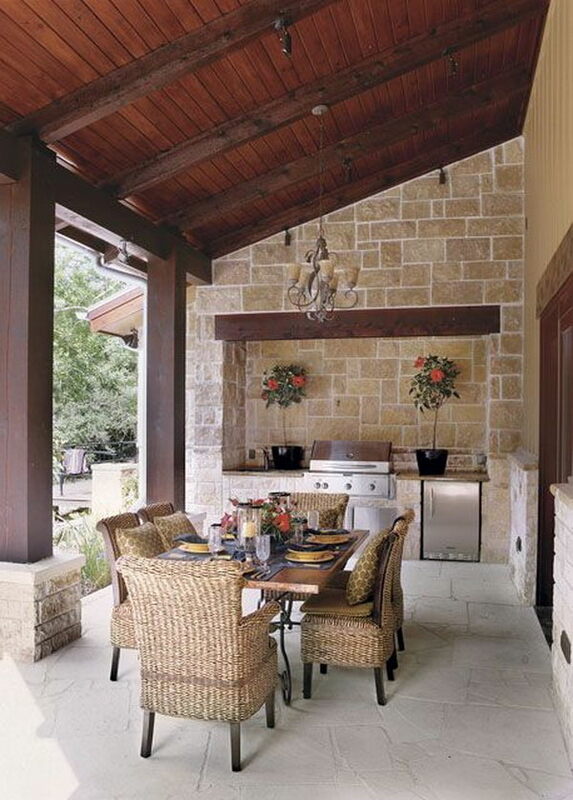 Designer Mick De Giulio used a variety of colors, shapes and texture of stone to give this outdoor kitchen an organic feeling. All of the appliances are from Belgard Hardscapes, from super strong paves to the island topped with bluestone. There’s a feeling of some age and maturity to this outdoor kitchen designed by Sandy Koepke in Manhattan Beach, California. It is really a great place for a party with a stunning outdoor fireplace, earthy dicers and beer on tap. The U-shaped layout of this Nantucket kitchen is zoned from hot to cold. All of the appliances and the stainless-steel cabinetry are designed to be weather-tight. 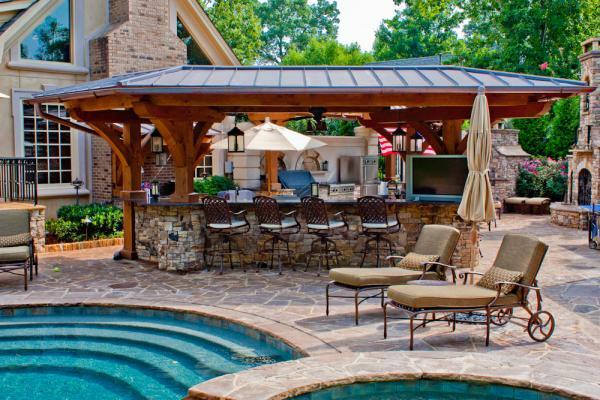 This luxurious and gorgeous outdoor kitchen add a cozy style to the comfortable living room. 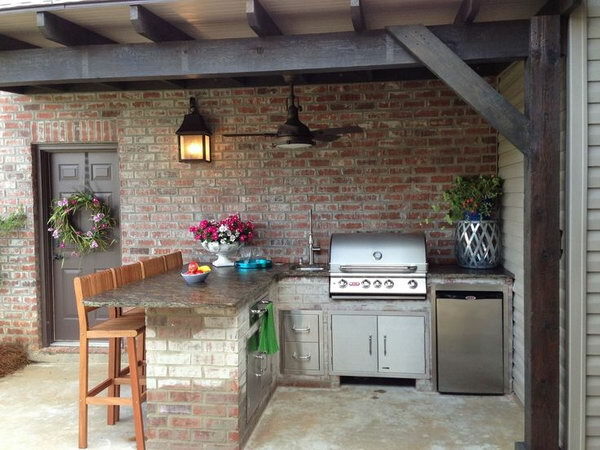 An outdoor kitchen doesn’t need to be fully exposed. 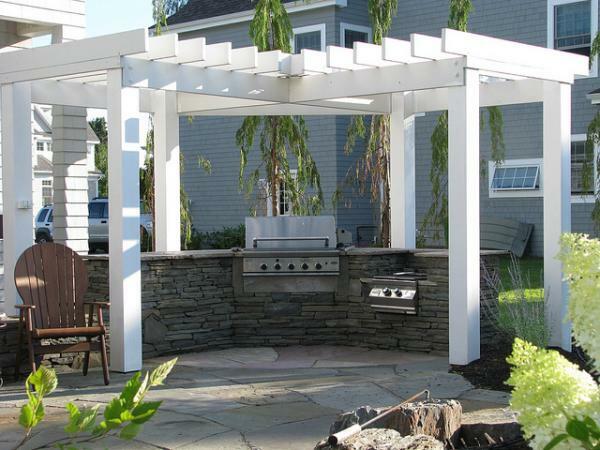 Here, designing a practical outdoor kitchen by making use of the corner can keep your furniture in good maintain. 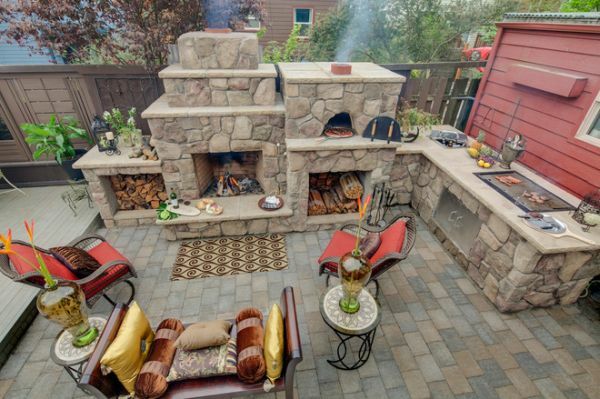 This outdoor kitchen is fully equipped with everything necessary for cooking, a simple pizza oven, fireplace and many other cool cooking tools. 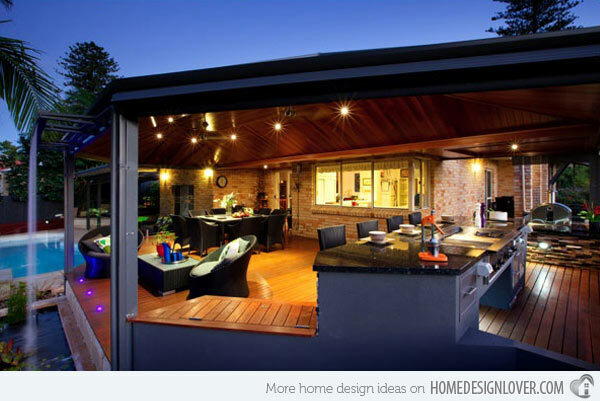 This modern outdoor kitchen has a beautiful design. The bricks suit the whole decor beautifully. A stone kitchen can be both functional and pretty. It is really a great place for a summer party with an amazing oven and a beer cooling poor. 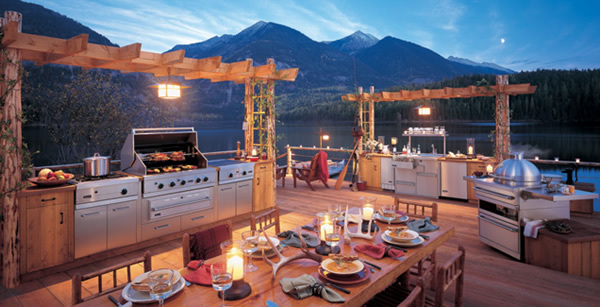 A view of the spectacular snow-clad mountains and the big lake near your backyard makes this outdoor kitchen even more amazing. 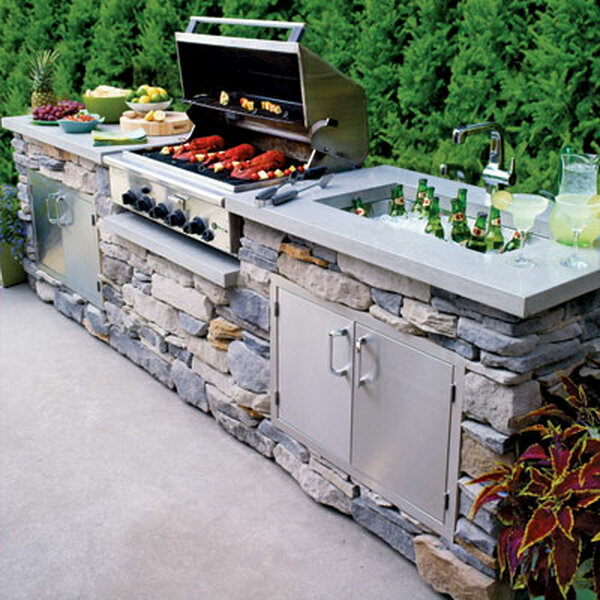 This stone outdoor kitchen features a refrigerator, grill, sink and storage, looking simple but fully functional. 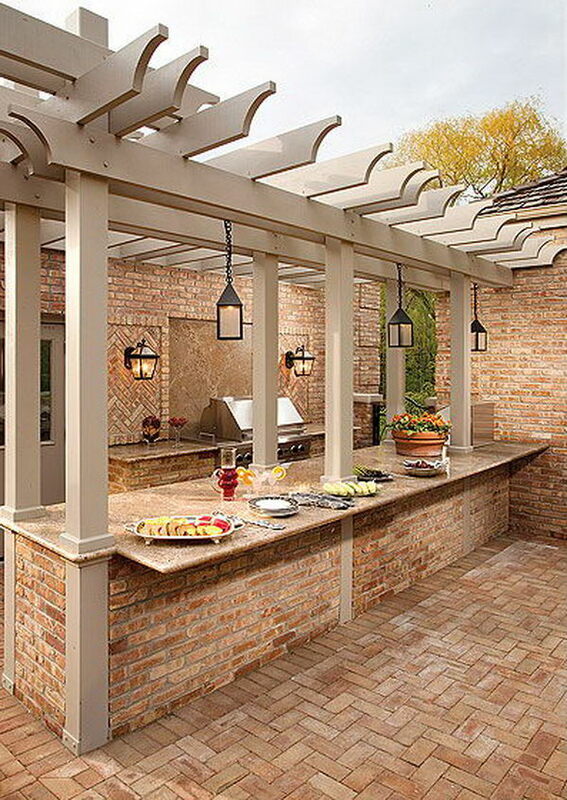 The wood roof and the stone structure are ideal and cool when cooking and dining during the summer night. 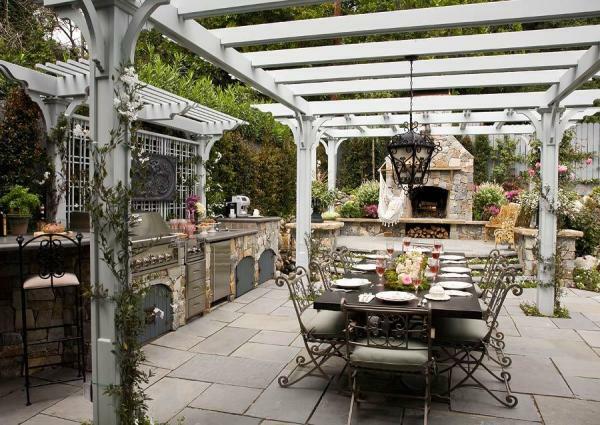 The chandelier adds some mystery and romance to this outdoor kitchen. The soft, warm lighting bright up the space and adds irresistible charm to these spring spots. It really fits with the foundation of rocks and grey brick. 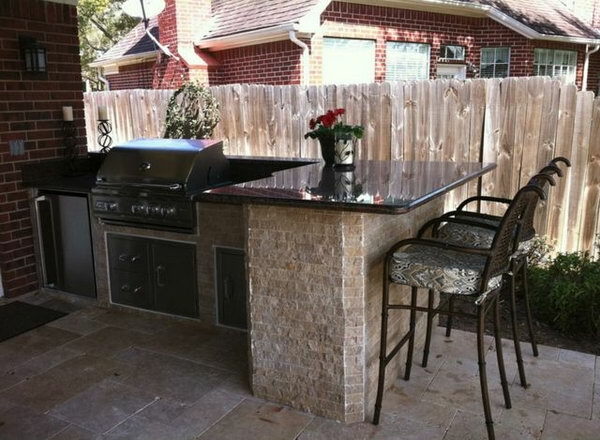 All materials of this outdoor kitchen are with high durability, which is practically zero maintenance. 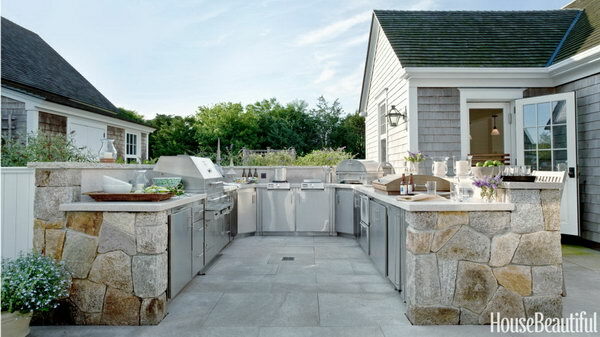 A smart outdoor kitchen connects to the house. 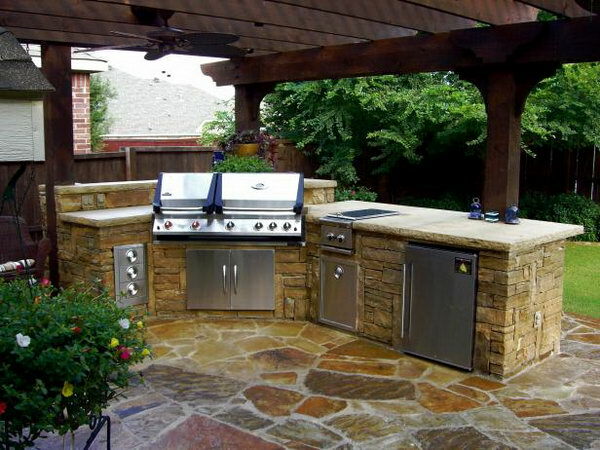 A smart outdoor kitchen should be closed to the house so that it doesn’t take you much time and effort to take out your cooking tools. 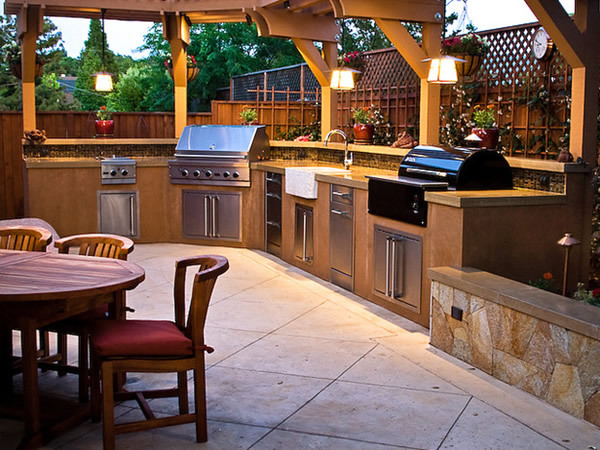 The combination of the lighting and the colors in this outdoor kitchen makes it looking more modern. Everything here looks very harmony. 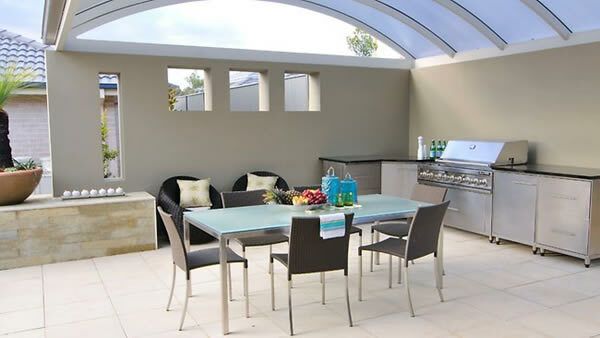 This is a typically modern outdoor kitchen with the glass roof and the grey, white and black elements. 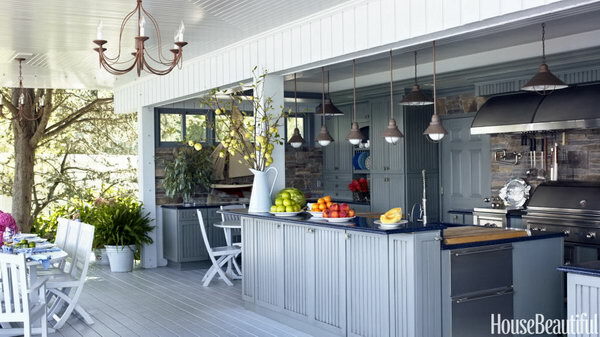 Plain and fancy cabinets with Nantucket-style doors and blue-toned Caesar stone on top plus the colors of water. It is a great place for cooking and holding a party during summer. 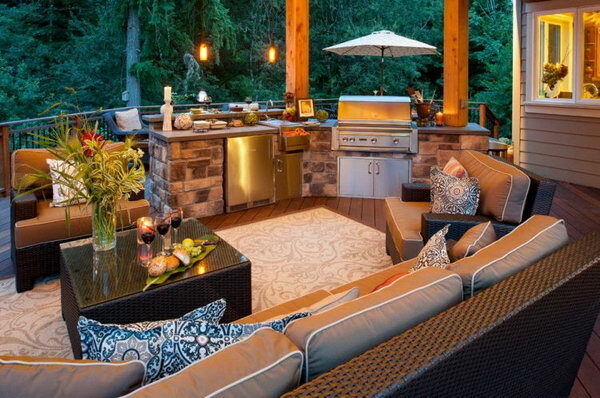 This outdoor kitchen features a good view of the nature scenery around. Holding a party here will make your gusts feel more free and comfortable. 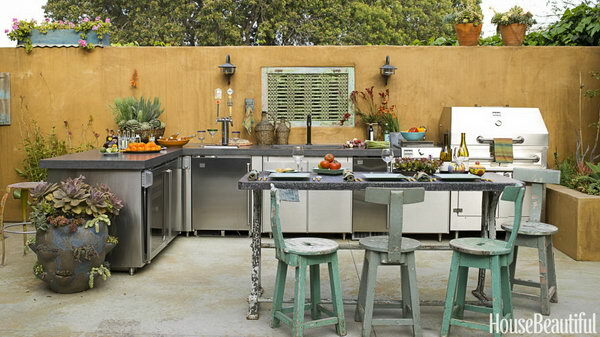 This outdoor kitchen takes its colors from the earth and the sky. It is about being friendly with nature. Looking simple but equipped with everything you need for cooking. It’s fully functional. 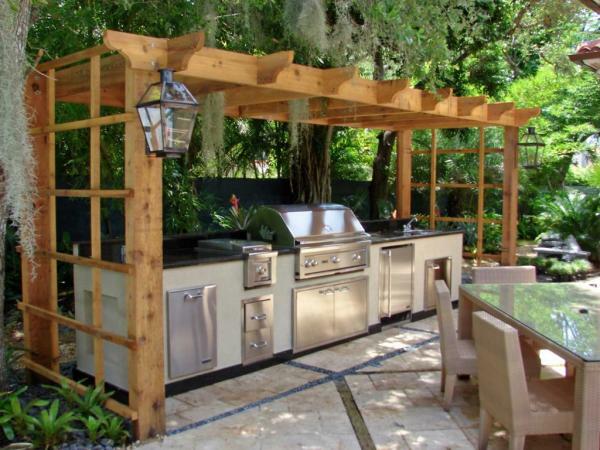 This beach outdoor kitchen located near the swimming pool area is every homeowner’s dream. Your guests will feel at home when dining and drinking here. 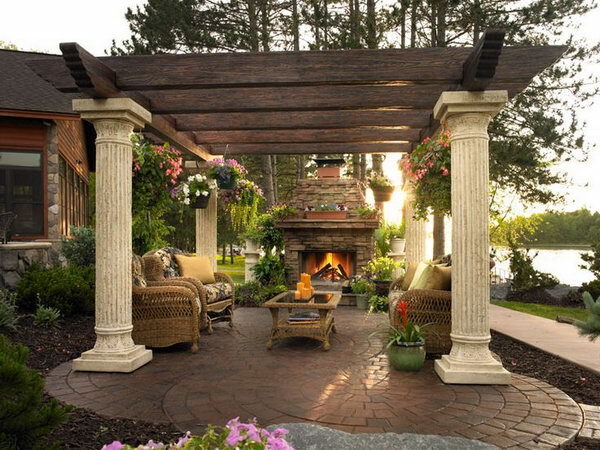 The traditional brick fireplace and the pergola made from wood are really nature-friendly. It’s not only a cooking place but also a nice comfortable seating area. 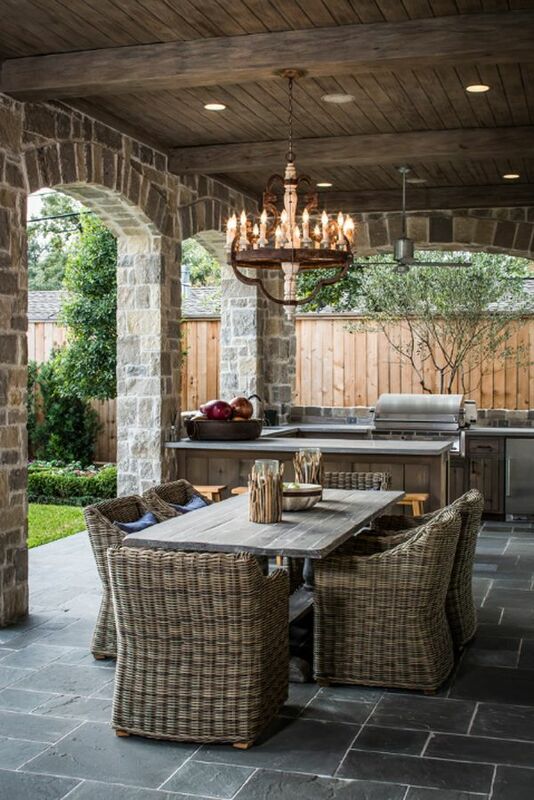 The open plan and the lighting design of this outdoor kitchen make it look luxurious and gorgeous. 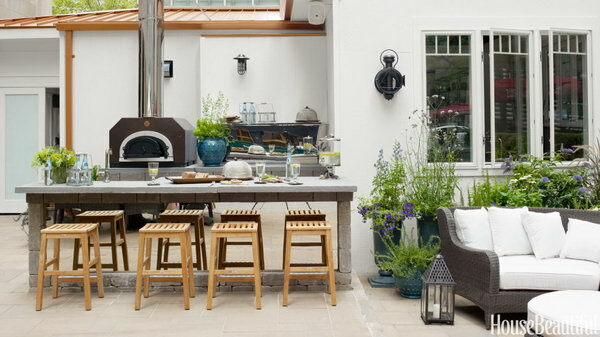 Build an outdoor kitchen in your courtyard and decorated with so many potted plants. 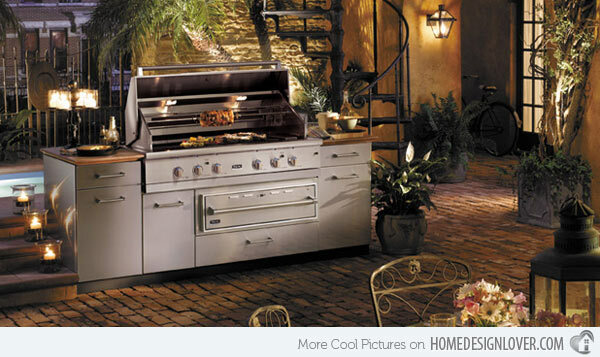 Be sure your special someone will be happy to see an outdoor kitchen as romantic as this. 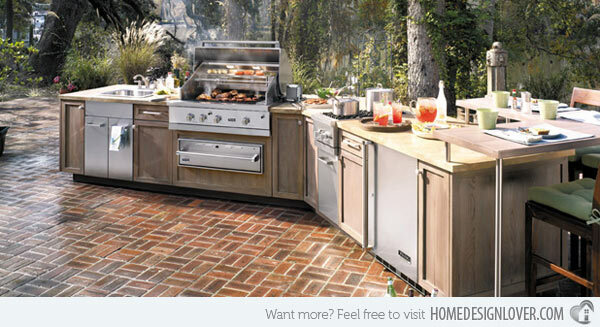 Everything looks so harmony in this wooden outdoor kitchen surrounded by the greens. It is really an enjoyment to cook exotic delicacies in the lap of nature. 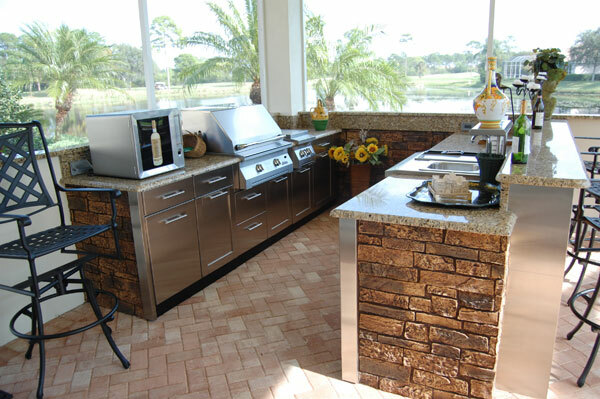 It shows a new style for the outdoor kitchen with interesting patio, storage and modern appliances in a beautiful lawn kitchen.